One of the major features of Windows 8 is its Metro interface. This comes nicely when you start Windows 8. The limitation of this metro interface is that only those apps can be added to it that have come directly from Windows 8 App Store. We have already mentioned how to add apps to Metro interface from Windows 8 app store. However, what if you want to add an app that did not come from App Store? Microsoft actually does lets you add even those apps that do not come from Windows 8 app store. Microsoft provides this permission to all those who have Windows 8 Developer license. This is provided so that if someone wants to develop apps for Windows 8 metro interface, they can test it out on their system. This means that if you have an app for Windows 8 metro interface that is not in app store as yet, you can actually install it on your Windows 8 system if you have a developer license. But don’t worry if you don’t have a developer license, yet. Microsoft has made it very easy to get a developer license for Windows 8 (for free). There are multiple ways to get Windows 8 developer license for consumer preview, as Microsoft explains here. The easiest one I found is via command prompt. This is as easy as just typing a command on command prompt. I’ll include instructions for that method here. We need to run a command via Windows PowerShell. This is different than normal Command prompt. 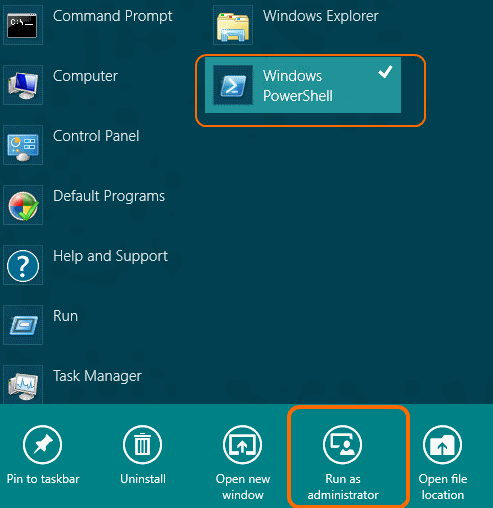 To access Windows PowerShell, go to metro screen of Windows 8, and right click anywhere. You will see option of “All Apps” at the bottom. Click on that. In the next screen, you will see an icon for Windows PowerShell app (in my case, it was at the far Right). Right click on that. This will show a toolbar at the bottom, with one of the options as “Run as Administrator”. Click on that, and accept the warning dialog box. Once you run this, you will be prompted to provide your Windows Live Id. Login with that, and Windows will download and install Developer license for Windows 8 on your computer. 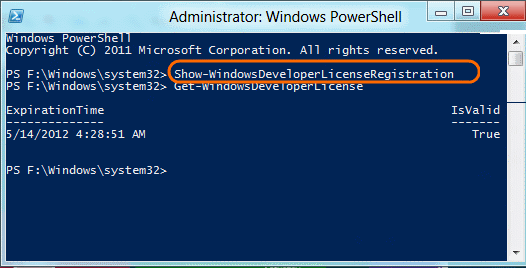 To see for how long the license is valid, just run this command in Windows PowerShell: Get-WindowsDeveloperLicense . This will show date and time till which your developer license is valid (check previous screenshot). In my case, I found that developer license was installed for one month only. Probably it needs to be renewed every month. Now you have Developer License for Windows 8 installed on your PC. Once you have developer license of Windows 8 installed, it becomes quite easy to install a compatible Windows 8 app in Metro interface. Note the use of word “compatible” in my previous sentence. I mentioned that because you cannot install just any software in Metro interface. The app that you are trying to install should have been created specifically for Metro interface. This is something that the developer of app has to take care of. Once you know that the app is compatible, just download the app to your Windows 8 computer, and follow the instructions that the developer of the app has provided to install that app. I came across an app which had a .bat file that had to be run as an administrator. The method may be different for the app that you are trying to install, so try to find installation instructions, or get in touch with the app developer. Note: As I mentioned above, the developer license that I installed came for just 1 month only. It is probable that unofficial apps will stop working once the developer license expires. So, keep a check on that too, and remember to reinstall the license before it expires. Sorry.. No clue about that error. let us know if you are able to find a fix to this.